"IT’S THE kind of place you’d drive right by in a car and not see unless you were really low on gas." That’s the way Lisa Watts described the tiny convenience store at a crossroads north of Woodbine in Camden County. The good news for the proprietor is that she did stop. And so did dozens of folks from around the country travelling with her. Watts, communications manager for the East Coast Greenway Alliance, was one of 45 people who rode their bicycles from Savannah to Titusville, Fla. last week on the alliances’ “Week a Year Tour,” an annual fundraising ride. “At least 30 of us stopped to buy cold drinks and snacks,” she said. That particular convenience store was not the only beneficiary of spending power on two wheels. Creative Catering café in Woodbine also received a visit. 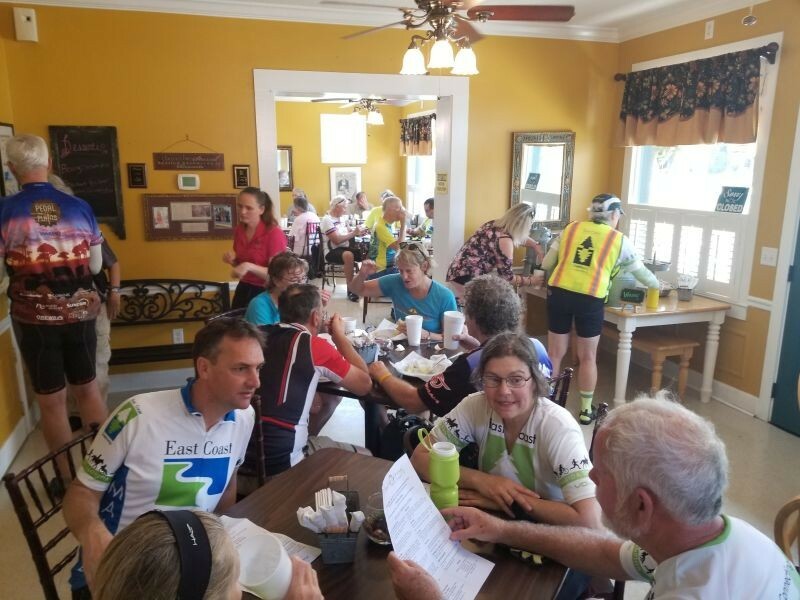 Cyclists following the route of the East Coast Greenway comprised most of the customers at the Creative Catering restaurant in Woodbine last Tuesday, illustrating the significant economic benefit bicycle tourism can bring to Coastal Georgia. “It was the only place open in the downtown area and we loved the air conditioning as much as anything. While it seemed we were overwhelming the small restaurant, the staff handled it well and the locals were very friendly,” she said. On the way down the coast, members of the group dined at Love’s Seafood in southern Chatham County and Skipper’s Fish Camp near Darien. Of the 165-mile route that runs through six coastal counties in Georgia, ten miles of greenway have been completed. 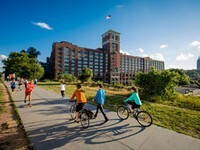 (The East Coast Greenway and the Coastal Georgia Greenway share much of the same route). By contrast, 50 miles of the 271-mile route have been constructed in South Carolina and in Florida just over 207 miles of the 579-mile route are complete. Maryland’s segment is comparable to Georgia’s at 164 miles, but is way out ahead with more than 57 miles of greenway for tourists and locals to use. 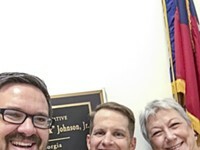 Brent Buice, the Greenway’s Savannah-based South Carolina and Georgia coordinator, is working to make the dream a reality. Elected officials, business owners, and residents on the coast have good reason to hope he succeeds. “What we hear over and over is a community will have its naysayers, sure that the Greenway will bring trouble or isn’t worth the cost,” Watts said. The Highway 17 corridor, which the current greenway route follows for much of the way through coastal Georgia, runs parallel to I-95. The two thoroughfares are within sight of each other in some places, yet they are worlds apart. There are prosperous places south of Savannah, but many communities feel left behind. This weekend the line at Southern Soul Barbecue on St. Simons was perhaps a little longer than usual, thanks to the RSM Classic golf tournament on nearby Sea Island. Private jets waited on the tarmac at McKinnon Airport across the street. When you’re blasting down the highway at 65 mph, it’s easy to miss Needwood — founded in 1866, it’s one of the oldest African-American churches in the state — much less stop to check out the buildings. But on a bike, it’s no trouble to pull over. As a rule, people on bikes stop more frequently to examine points of interest and to reprovision than do people in cars. “On a typical day of the bike tour, we are stopping mid-morning at convenience stores for drinks and snacks, a restaurant lunch stop, afternoon snack stop, and dinner,” Watts said. That lunch in Woodbine alone put about $300 in the cash register at Creative Catering. In all, Watts estimates the Week a Year tour pumped between $50-75,000 into local economies along the route. 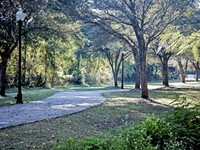 A completed East Coast Greenway would repeat similar scenarios every day in Coastal Georgia.